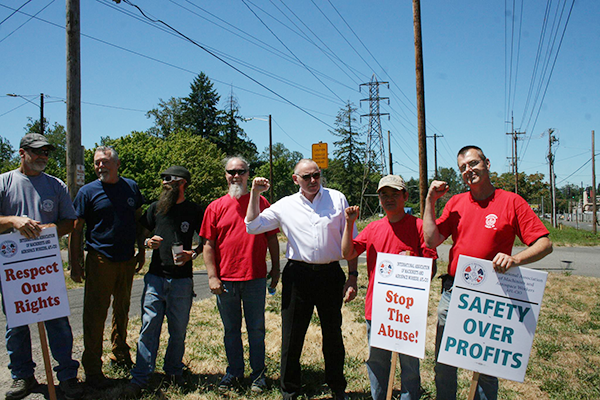 IAM members and community supporters hosted a rally in Portland, OR demanding Precision Castparts sit down at the bargaining table with 100 welders who voted to go IAM last September. The rally marked the one-year anniversary of the election filing date for the highly skilled welders. “The support given us by the IAM has allowed me and my fellow welders to have the confidence and strength to keep our heads up and remain in the fight to demand a fair and equitable voice in our future,” said Precision Castparts welder RJ Brady. The group of welders were recently on the winning end of an NLRB ruling giving them the right to organize after an eight-month legal battle. The ruling stated due to their specialized craft, the highly skilled welders could be a distinct bargaining unit within the 2,500-person workforce at Precision and could vote to join the IAM as a 100-person group.